Physical Chemistry: An Advanced Treatise: Kinetics of Gas Reactions, Volume VIB, is devoted to gas phase chemical reactions. The purpose of this treatise is to present a comprehensive treatment of physical chemistry for advanced students and investigators in a reasonably small number of volumes. An attempt has been made to include all important topics in physical chemistry together with borderline subjects which are of particular interest and importance. The book contains six chapters and begins with a study on the elastic and inelastic scattering of ions on molecules, including such topics as rainbow scattering, reactive scattering, and experimental procedures and results of high-resolution measurements. 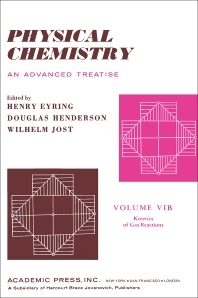 This is followed by separate chapters on collision processes and the theory of elastic scattering; and atom reactions, with a discussion of experimental techniques (static, flow, and pulse methods), among the selected examples being the reactions of H, O, C, and N atoms with alkanes, alkenes, acetylene, sulfur, and nitrogen compounds. Subsequent chapters deal with experimental methods and results obtained by several techniques of relaxation methods in gases; thermal unimolecular reactions; and the interactions between chemical reactions, transport processes, and flow phenomena.